A treasure trove of unusual and unique items with a strong Welsh flavour is set to transform the National Botanic Garden of Wales, as the Derwen Antiques Fair prepares to return. Antiques, collectables, retro and vintage will take centre stage among the flora and fauna at the Carmarthenshire gardens on January 28 and 29, in a popular event which is growing every year. Derwen Fairs’ flagship event has increased from 23 stalls in the early days, to more than 100 dotted around the site including the Beehive Theatre, the Large Marquee and the impressive Regency Principality House. 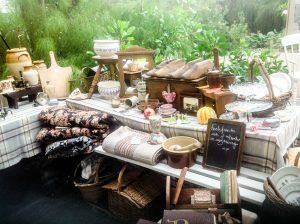 Visitors can view Welsh art, Welsh pottery and Welsh oak furniture among the mediterranean plants in Sir Norman Foster’s glasshouse, and a vintage market will take over the entire courtyard. Established 17 years ago, the vibrant atmosphere of Derwen Fairs attracts thousands of antiques enthusiasts each day. A large range of country pine furniture, rare books, Treen and Ewenny pottery and in the Theatr Botanica for taxidermy and the exotic will be featured in the fair. The Vintage market houses smaller marquees showing off vintage toys,clothing and retro furniture plus numerous up-cycled furniture and quirky items. A selection of militaria stands will display unusual items, including rare medals, military swords and vintage fire arms. From furniture to fishing reels, Persian carpets to exquisite jewellery, most areas of collecting will be included, plus some rare items. One important collection to be showcased is an interesting collection of Wemyss ware. This line of pottery hailed from Kirkcaldy in Fyfe, Scotland and is popular with collectors, with some rarer items commanding four figure sums. Bargain Hunt recently filmed their programme from the National Botanic Gardens fair, with one contestant picking a rare Wemyss piece decorated with a daffodil to take to auction. 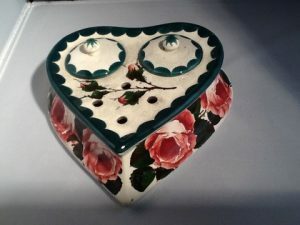 Helen and Alistair who sold the pot ,will return to the fair to display their impressive Wemyss collection, including a rare heart shaped inkwell. Wemyss: a rare heart shaped inkwell. Collectors can expect a large variety of themes from ancient Chinese to the retro 60s and country farmhouse among the stands. The fair is open 10am to 4.30pm, admission to the garden is £3, with free parking.